My sister’s birthday makes January 31st a very special day. This year however, proved to be extra noteworthy thanks to the Super Blue Blood Moon Eclipse. A bluemoon because of two full moons in one month, a supermoon because it was slightly closer to Earth, and a lunar eclipse because the Earth was blocking the sun from the moon. The red in the moon is caused from sunlight being filtered and refracted by the earth's atmosphere. After witnessing the spectacular Great American Solar Eclipse in the summer of 2017, I have been hooked on cosmic phenomenons visible from Earth. As much beauty as there is on Earth, the complexity of the cosmos aligning is far more eye-catching for me. The biggest concern that I had before the event was the potential for cloud coverage. 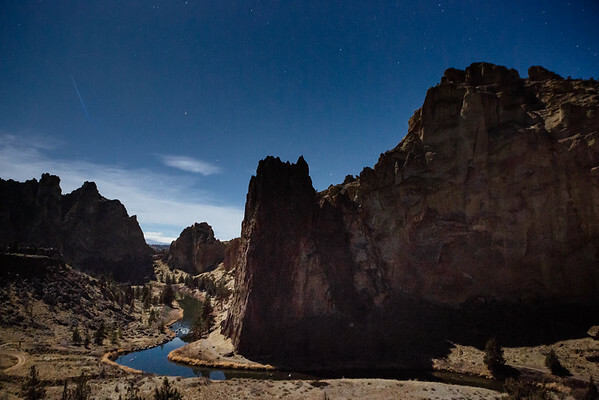 To avoid this, my friend and I drove out of Eugene, past the mountains, and into Smith Rock State Park in Central Oregon. Our chances of having the eclipse clouded out were much smaller, but still a possibility. 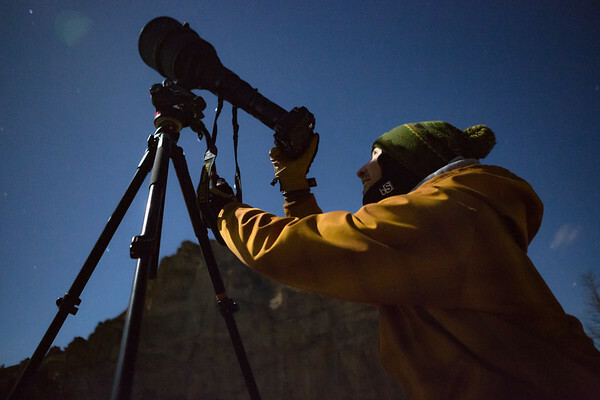 My good friend, Jake Smith, aligns his camera with the moon. His face is illuminated by moonlight that is magnified through his lens. We arrived at 2:00a.m. and could see the entire park without headlamps thanks to the full moon. We had around an hour until the first stage of the eclipse began. In the meantime, we searched for potential compositions and found some fun shots. My first test shot perfectly captured a shooting star over the park, a misleading omen for the rest of the night. By 5:00a.m., clouds came in from the West, only half an hour before totality. At this point, the park had around 40 photographers anticipating the event. 15 minutes before totality, clouds covered the entire sky, leaving all of us out of luck. We decided to head back to Eugene at 5:30a.m., but not empty handed. 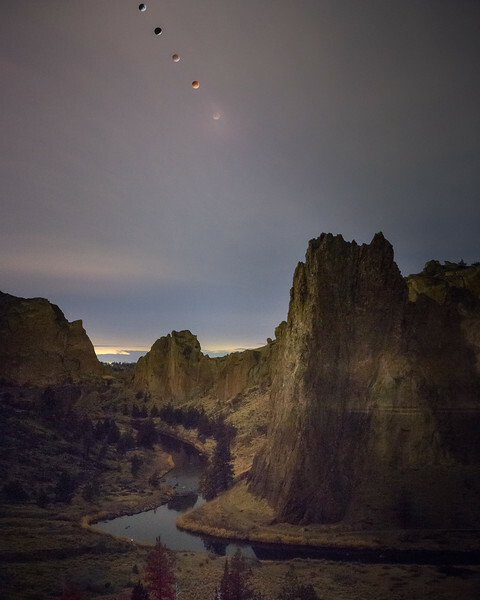 We all enjoyed a great night out shooting stars and had to opportunity to be a part of an eclipse in one of Oregon’s finest locations. 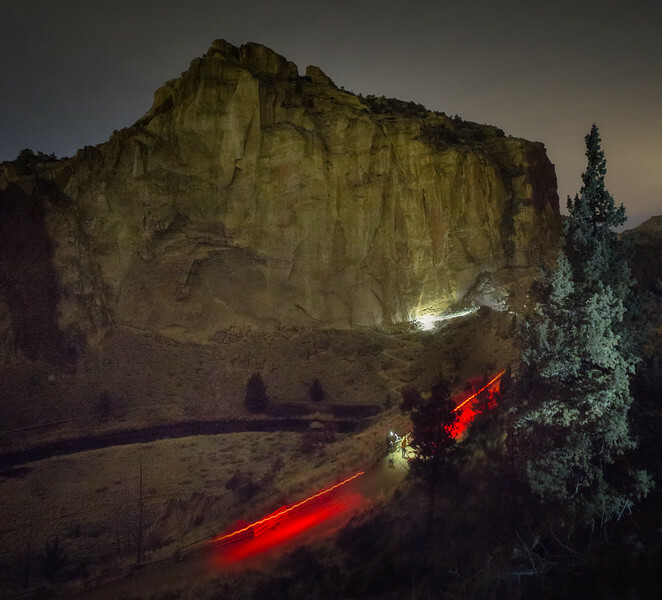 Light trails from fellow photographers illuminate paths at Smith Rock. This composite image displays the first half of the eclipse before the heavy weather set in. This was created by stacking a combination of telephoto frames and a wide angle frame.